We all know that visual content is almost as important as the written content. 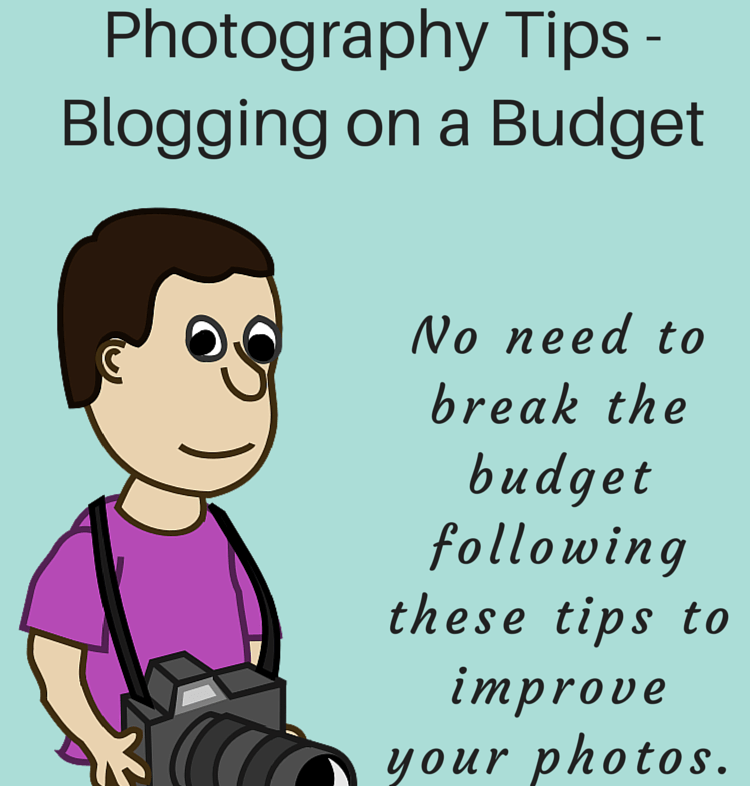 Let’s get to work with some photography tips while blogging on a budget. What sort of camera? My answer is to use the best camera that you have. Not the most convenient, the best. Cameras on phones have improved, and many photos will come up quite well on the Internet. Use the phone camera when you are out and about, it’s light and easy. I don’t use a phone camera very much, but many of these tips can be used to help with whatever camera you use. If you love photography and you don’t have a great camera, I suggest that you choose your ideal camera and put it on your wish list. If it’s not acknowledged as a goal it probably never will be a reality. I use a Digital SLR Canon, I love it, I am still learning new things about it, even though it is years old. Another option is to buy images from stock agencies. The budget way is to only buy the small version of the image. It will be much cheaper and because it is good quality it can be enlarged with photo software. Mostly I get these small images for one dollar. Always put a watermark on your original photos. I use my site name or logo at the bottom of the photo and set the opacity at about 50%. I know this type of watermark does not stop theft, but it does tell honest people that this photo is not free to take. On a PC hold down the Alt key while on the number pad on the right side of the keyboard press 0169 – release the ALT key and you will have the © symbol. Every photo or graphic that I put on my site has been put on a diet first. We are talking about the file size. A smaller file size not only loads faster but it uses less bandwidth than large files. So for you and the user, it is using much less data. All of my photos that are .jpg or png files go into Tiny Png. Tiny Png is totally free. It is also available as a plugin for WordPress. I just keep a link handy and use their site, not the plugin. The photos take a few seconds and come back very much lighter in file size. The resolution will be 72, an ideal resolution for the Internet. I take photos between 250-300 resolution and as a photographer it hurts to put them down to 72. But there is no doubt that 72 is lighter and faster. There is not much sense having high definition wonderful photos that nobody wants to wait while they load. Don’t forget to re-save your photos after they have been slimmed down. Another photographic tip is to have the images at the right size before they are placed in the library. A large photo that is decreased in size on the post does not cut the file size. When the page is loaded, the larger size that is in the library is loaded. Everything that will help a page load quickly, is worth doing. For example, you have four photos that are to be used in the one post, it helps to save them using the same first word. If it’s a pie recipe, then use the word pie on each photo e.g. pie ingredients, pie crust, pie filling, pie slice. Now when you go to use the photos they will all be filed together and easy to find. It also helps to use relevant file names and not just numbers. Always use an alternate text. The alternate text should be descriptive to tell the user what the photo is about. Then if the internet is slow and the photo does not load, the alt text will show. Your alternate text may just say Ingredients. If you can, naturally add your keywords to the alternate text to enhance your SEO (search engine optimization). It may read Apple Pie Ingredients. I will use recipes as an example. Recipes and crafts would be some of the most frequent reasons we need photos for our blogs and are mostly original taken by the blogger. For recipes, there is no need to spend on buying expensive backgrounds. The best food photos are close-ups of the food item. If there is too much background in the photo it can become a distraction. Focus your camera on the subject to keep it sharp. The background should then be a little blurry to contrast with the sharpness of the subject. When setting up to photograph your subject observe what colors compliment and add to the scene. Blogging on a budget means prioritizing our spending. What is more important than a fancy background is a nice serving dish or cake plate. I often take a look around charity stores looking for these items. This cake stand holding the pavlova is one of my favorites that I made from an old clock face for a couple of dollars. Take a nice close up of your project and to give some depth, just add an item in the foreground like the mango in front of the pavlova. Don’t be afraid to crop the photo to give a clearer view of your main subject. Here is a photo where I put the piece of pie in the foreground, the center of attention, and in the background out of focus, is the large pie dish. When you are taking your photos don’t forget to try several different angles of the same subject. Recently a popular angle for taking food photos is from directly above the subject, looking down. Personally, I don’t use that very often, but some of these shots do look good. Joanne from Whats on the List uses this angle very effectively. Try taking shots from left or right of the object, and different degrees of higher and lower. Then choose the photo with the most appeal. Keep the background simple as in this wooden doll photo. Don’t let the background distract from your subject. When taking a close photo of anything, it pays to use a tripod. In fact, I would say that a tripod is essential. I know it seems like extra work to use a tripod, but the results will speak for themselves. In your photo editing program put your photo size up to 100% and you will soon see if camera shake has affected your photo. Camera shake is one of the first things that would disqualify your photo being accepted by a photo stock agency. Unless it is for artistic purposes, a crooked horizon or a plate that looks like it will fall off the table will immediately look like an amateur. You want a professional looking blog site. Editing programs usually provide a way to correct the level. When possible use natural light, it is much more pleasant to the eye. I very rarely use a flash because of the harshness of shadows. Therefore if a flash is required bounce the light off a white ceiling or wall. Another method to diffuse the light is to place a tissue or similar item over the flash. Diffused light gives quite a natural quality to the photo, by softening it. Sometimes there is a dark side to your scene, a budget way to get more light on that side is to use a sheet of white styrofoam or project board to reflect light onto the subject. A led light flashlight directed at the styrofoam will increase the reflected light on your subject. Here is another method when the available light is low. Set the camera on AV e.g. F8 so that the shutter speed will automatically be slow, letting in the right amount of even light. Taking photos with a slow shutter speed, the camera must be on a tripod. The rule of thumb is that all digital photos need some sharpening. It can make a huge difference to the quality of your photo. The exception to the rule is people’s faces. If you sharpen them too much, they will look older, by emphasizing their character lines. Not many of us want that. Most other projects will benefit from sharpening. Some cameras have built-in sharpening. I tend to turn that off so that I can control the amount of sharpening I want to make the photo look its best. Experiment with your photos in photo editing software, before and after sharpening. If you get a pale halo effect around your subject, you have sharpened it a bit too much. Experiment with adjustments like the saturation and exposure. Saturation will deepen the colors, see if your photo looks better with the more intense colors or not. Would a little more exposure brighten the appeal of your photo? The more you critically look at your photos the easier it is to spot what looks best. Photography tips -you want to make an income with your blog? Follow what successful bloggers do. The bloggers with food or craft sites, or other visual subjects like travel, will have taken a course in Photography. Lifting the standard of your photography will work to give your blog a professional feel. Blogging on a budget, no worries, there are plenty of free tutorials on the Internet. Darren Rowse has a website just full of help and tutorials, free and not free ones. There are many other sites with free tutorials as well. Have you got a keen interest in photo editing? Photoshop and Lightroom are the programs of choice. Blogging on a budget these programs may need to stay on your wish list for a time. There is a free program that does nearly everything that Photoshop does, called Gimp. You can download it here. You will notice on this page there is a user manual, you will need that too. Those new to photo editing will have to work at mastering this program as you would have to in Photoshop. When I am learning new procedures, I like learning from videos. There are a number of tutorials for Gimp beginners here. As far as photography tips go I have hardly scratched the surface. For the relative beginner, this is more than enough to see improvement in your photos. All good suggestions, Kathleen. The photography part of blogging is a challenge for me. Did not know about Gimp. And I really need a tripod! Thanks for the comments Cathy. If you enjoy photo editing, then Gimp would be good, it does take some learning. This is such a timely post for me Kathleen Thank you! I’m not very creative with my photography and find it difficult to style. Thanks for some helpful information which I’ve pinned so I have a handy reference. Your pavlova looks delicious by the way. I use Canva but haven’t heard of TinyPNG usually I use compressor but will give TinyPNG a go as well as Gimp, which I also haven’t heard of.. I find it time consuming making a feature image, one for FB and one for pinterest. Any tips? All good points you make here. What software did you use to make the image logo in the corner of your photos? Thank you Kathleen for sharing this post at the Wednesday AIM Link Party. I shared it on my social media sites. Thanks for your comments here. I use Photoshop for most of my image design and editing. I could make you a photo logo brand to place on your images along with a copyright sign. Send me an email if you would like that. Thanks for the tips. Food photography is something I’m really having to learn but I am being inspired by all the great photos I find at the link parties. I’m already looking back at my first photos and cringing! I’m sure I’ll be coming back to these tips again. Kathleen, this post is chock full of great tips and ideas for using images in our blogs! Styling photos is an art regardless of the camera. Great stuff!